Over the past twenty years there has been a significant increase in underwater activities such as scuba diving which, coupled with the adventure andromance always associated with shipwrecks, has led to rapid developments in the discovery and excavation of shipwrecked material. These shipwrecks are invaluable archaeological 'time capsules', which in themajoriety of cases have come to an equilibrium with their environment. As soon as artefacts on the wreck site are moved, this equilibrium is disturbed, and the artefacts may commence to deteriorate, sometimes in a rapid and devastating fashion. In fact excavation without having conservation facilities available is vandalism--the artefacts are much safer being left on the sea bed. 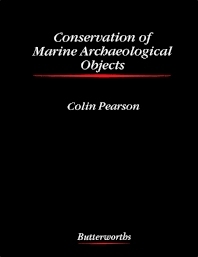 Such famous shipwrecks as the Mary Rose (1545), the Wasa (1628) and the Batabia (1629) have not only brought the world's attention to these unique finds, but have also produced tremendous conservation problems. The treatment of a 30 metre waterlogged wooden hull or large cast iron cannon is still causing headaches to conservators.